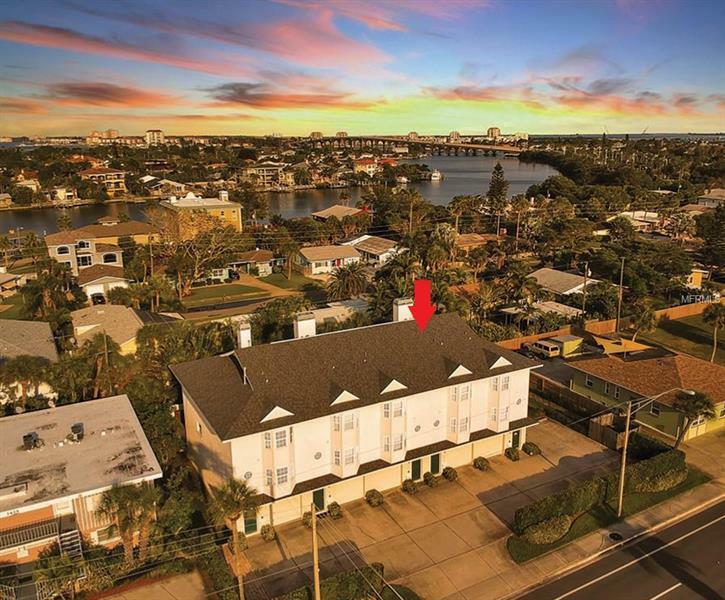 Located just north of the Don Ce Sar Hotel and across the street from the Gulf of Mexico â walk to the beach for beautiful St. Pete Beach sunsets! This spacious tri-level two bedroom, two and a half bath townhome features partial gulf views from both living levels, second floor eat-in kitchen with bay windows, breakfast bar, and dining & living room area with wood burning fireplace, and a covered balcony with spiral staircase that leads to a private fenced in paver patio. The third level features a split bedroom plan, stackable washer & dryer closet for added convenience, and master bedroom with vaulted ceilings and en suite bathroom with a double-sink vanity, large tub and separate shower. The first level features a one-car garage with lots of storage and extra large utility room with full-size washer and dryer (2nd set), laundry tub, new water softener system and glass sliders that lead out to the spacious patio. Plus new roof and recently replaced HVAC, water heater and dishwasher â and plantation shutters throughout. This move-in ready Maritana Cay townhouse is pet friendly with grassy dog run area on south side of building, close to restaurants, shopping and historic Pass A Grille. Also easy access to Pinellas Bayway, I-275 and downtown St. Petersburg. A must see - make an appointment today!